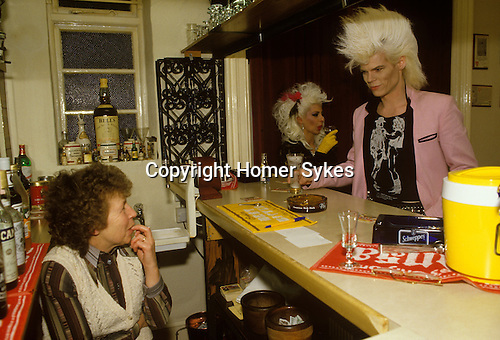 Sigue Sigue Sputnik band members Neal Whitmore aka Neil X and Jane Farrimond aka Yana Yaya at the bar of a bed and breakfast hotel. The landlady serves drinks before that evenings gig. Bed and Breakfast Hotel landlady. Newcastle upon Tyne, UK. Sigue Sigue Sputnik, band members Neal Whitmore aka Neil X, and Jane Farrimond aka Yana Yaya. Neal is probably wearing copy of a Malcolm McLaren cowboys t-shirt originally sold by Seditionaries, and later copied by Boy, a Vivenne Westwood boutique at 430 Kings Road London.The t shirt is based on a Jim French drawing. New Romantics movement. Jim French (14 July 1932 - 16 June 2017) American photographer and illustrator.